This Ruby on Rails sample application is modeled after a typical call center experience with an IVR but with more Reese's Pieces. Stranded aliens can call a phone number and receive instructions on how to get out of earth safely or call their home planet directly. In this tutorial we'll show you the key bits of code to make this work. To run this sample app yourself, download the code and follow the instructions on GitHub. Read how Livestream and other companies built IVR phone trees with Twilio. Find examples and sample code for many web languages on our IVR application page. Click here to start the tutorial! 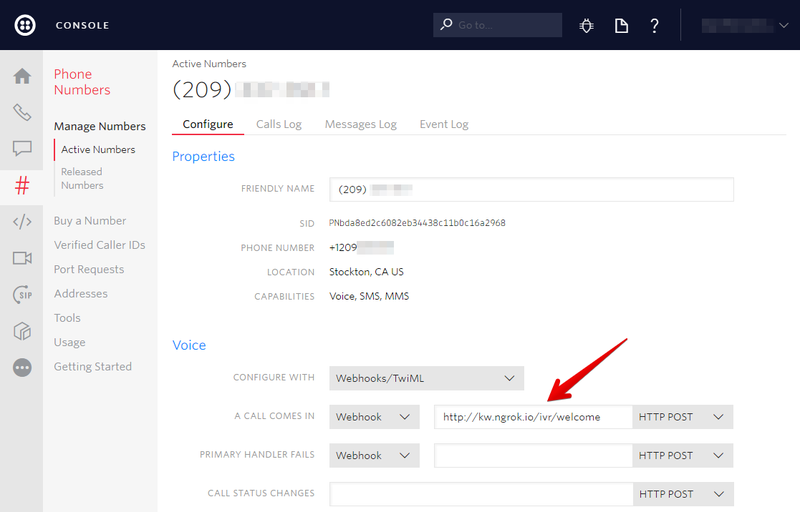 To initiate the phone tree, we need to configure one of our Twilio numbers to send our web application an HTTP request when we get an incoming call. Click on one of your numbers and configure the Voice URL to point to our app. In our code the route will be /ivr/welcome. If you don't already have a server configured to use as your webhook, ngrok is a great tool for testing webhooks locally. With our Twilio number configured, we are prepared to respond to the Twilio request. Our Twilio number is now configured to send HTTP requests to this controller method on any incoming voice calls. Our app responds with TwiML to tell Twilio what to do in response to the message. In this case we tell Twilio to Gather the input from the caller and Say a welcome message. After reading the text to the caller and retrieving their input, Twilio will send this input to our application. The gather's action parameter takes an absolute or relative URL as a value. In our case, this is the menu route. When the caller has finished entering digits, Twilio will make a GET or POST request to this URL including a Digits parameter with the number our caller chose. After making this request, Twilio will continue the current call using the TwiML received in your response. Any TwiML verbs occurring after a <Gather> are unreachable, unless the caller doesn't enter any digits. Now that we have told Twilio where to send the caller's input, we can look at how to process that input. If our caller chooses '1' for directions, we use the twiml_say helper method to respond with TwiML that will Say directions to our caller's extraction point. If the caller chooses '2' to call their home planet, we need to gather more input from them. We'll cover this in the next step. If the caller enters anything else, we respond with a TwiML Redirect to the main menu. That was only the main menu and the first option. If the caller chooses '2', we will take them to the Planet Directory in order to collect more input. If our callers choose to call their home planet, we will read them the planet directory. This is similar to a typical "company directory" feature of most IVRs. In our TwiML response we use a Gather verb again to receive our caller's input. This time, the action verb points to the planets route, which will switch our response based on what the caller chooses. The TwiML response we return for that route uses a Dial verb with the appropriate phone number to connect our caller to their home planet.The current numbers are hardcoded, but we can also set those numbers using environment variables. That's it! We've just implemented an IVR phone tree that will delight and serve your customers. Instantly collect structured data from your users with a survey conducted over a voice call or SMS text messages. Click-to-call enables your company to convert web traffic into phone calls with the click of a button. Thanks for checking out this tutorial! If you have any feedback to share with us, we'd love to hear it. Connect with us on Twitter and let us know what you build!